Saturday, April 27, at 7 p.m. NEW VENUE: Brick Row, 19725 Oak Street in Cornelius. (behind the police station in Old Town). 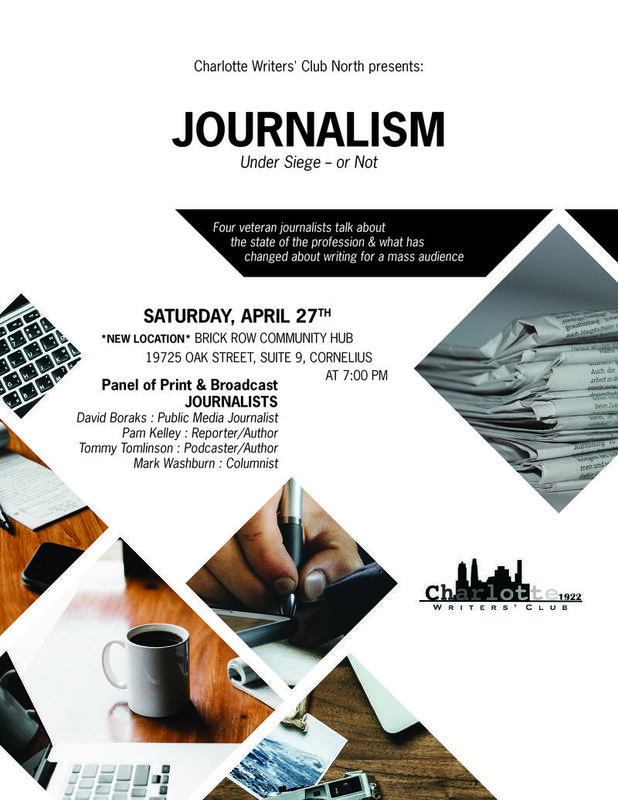 Doors will open at 6:30 p.m.
Charlotte Writers' Club North invites you to meet the press for a panel discussion, with David Boraks news journalist WFAE, Mark Washburn, media journalist Charlotte Observer, Tommy Tomlinson, podcast journalist and author of The Elephant in the Room and Pam Kelley, former Observer reporter and author of Money Rock. August 12, 2018 -- 2pm - A reading and book signing for Idol Talk, with Tamra Wilson, Judy Goldman, Amy Rogers, and Lisa Williams Kline. October 13, 2018: 4pm-5pm book release party in Davidson at Main Street Books for Lillian's Flying School by Nancy Lammers, co-sponsored by MSBs and CWC North. November 1, 2018 - 7pm - reading and discussion with Ann Campanella, author of Motherhood: Lost and Found, a memoir; Mary Ann Drummond, author of Grandma & Me, a kid's guide for Alzheimer's & Dementia, and Meet Me Where I Am, a caregiving guide, and Frank Morelli, author of the young adult novel, No Sad Songs. Saturday, March 16, 2019 - 4pm- Reading Book Signing at Main Street Books, 126 South Main, Davidson for Judy Goldman’s new release: Together: A Memoir of a Marriage and a Medical Mishap (to be published by Nan A. Talese/Doubleday, Feb. 12, 2019), co-sponsored by Main Street Books and CWC North. Sunday, March 31, 2019 - 3pm- Book launch in Davidson at Main Street Books, for One Week of You by Lisa Williams Kline, to be published by Blue Crow Publishing in 2019, co-sponsored by Main Street Books and CWC North. Saturday, April 27, at 7 p.m. at the Warehouse Performing Arts Center, 9216 Westmoreland Road, in Cornelius. Charlotte Writers’ Club North invites you to meet the press for a panel discussion, Journalism Under Siege or Not with David Boraks news journalist WFAE, Mark Washburn, media journalist Charlotte Observer, Tommy Tomlinson, podcast journalist and author of The Elephant in the Room and Pam Kelley, former Observer reporter and author of Money Rock.